Big Easy Con is excited to be in New Orleans, June 1-2, 2019! While our primary focus is that of comics, comic creators, and the creative process, Big Easy Con also provides it's attendees with access to gaming, sci-fi, cosplay, anime, fantasy, and everything in between. Our goal is to provide you with a rewarding, fun, and family-friendly event experience! You can get all the information about Big Easy Con at BigEasyCon.com, and follow us on Facebook, Instagram and Twitter. 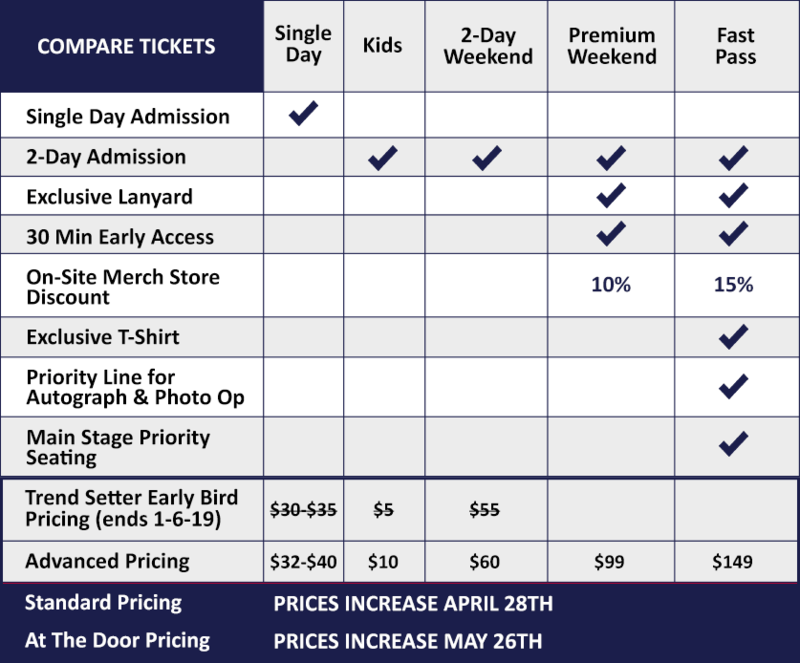 A weekend or single day ticket gets you into 99% of everything at Big Easy Con, but if you want to get in early and get your hands on some sweet swag, you will want to get a Fast Pass or Premium Pass. Any pass purchased by Friday, April 5 can be mailed to the address you provided. BADGES WILL NOT BE MAILED IMMEDIATELY AFTER YOUR ORDER. Badges will be mailed to US addresses only, with all international orders held for pick up. Special Event tickets and merchandise orders will also all be held for pick up at Big Easy Con. Merchandise will not be mailed and must be picked up at Big Easy Con. All attendees three-years-old and up need a ticket to Big Easy Con. We recommend all children under 18 attend with an adult, and all children under 13 must have an adult with them while attending Big Easy Con. All ticket sales are final, with no refunds or cancellations. Tickets are subject to an 8% service fee. All Showclix processing fees are all added at Checkout. Taxes and Showclix fees are a percentage of your total ticket price. Upgrades available only on an as available basis. Separate tickets may need to be purchased for certain events. We’re adding guests to Big Easy Con all the time. You can check out our current Guest List for our current roster and follow us on Facebook, Instagram, and Twitter to be the first to learn about new celebrities and creators. Big Easy Con’s celebrity guests generally spend time signing autographs at their booth, attending scheduled photo op sessions, and doing Q&A sessions with fans. Autograph sales, photo op sales, and the programming schedule will be release about 3-4 weeks before Big Easy Con 2019. The 2019 Big Easy Con is a WEEKEND of fun, learning, and discovery! We hope to see you there!